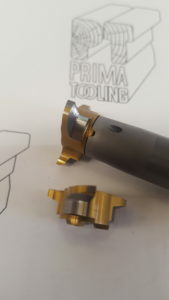 Solid Carbide Milling tools are manufactured by both Prima Tooling Ltd and Sutton Tools. We produce high quality and high performance cutting tools for all of the latest applications. Bespoke tools can be designed and manufactured quickly, using our many years of experience and the latest technology to perfect the design and performance. Once designed, our tools are then ground on our latest CNC automatic grinding machines. After that they are inspected for dimensional accuracy and form on our CNC optical measuring machine. Our in-house grinding and manufacturing facilities allow us to modify any standard tools. In other words any tooling available from the range of Sutton Tools. 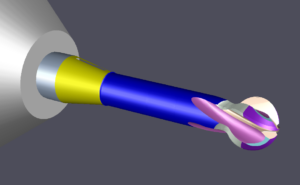 As well as manufacturing our own bespoke tooling using our 3D modelling and simulation software. We can modify a standard solid carbide off the shelf tool. For example by adding or increasing corner radii size, corner chamfer or increasing neck length to obtain a greater reach. Modifying a standard tool where possible reduces lead time, allowing us to get the tool to our customer as soon as possible. Alongside our own designed and manufactured bespoke tooling, being able to supply Sutton Tools to our customers means we are able to cover all areas of Engineering applications. Founded in 1917, Sutton Tools began as a family enterprise, manufacturing threads and gauges, and over time has expanded its expertise into a broader portfolio of cutting tools. Today, Sutton Tools remains an Australian family business that is renowned for its high-quality power tool accessories and cutting tools for the hardware market and a wide range of specialised industrial applications. While Sutton Tools supplies tools to a broad spectrum of industries – including general manufacturing, electronic manufacturing, automotive, medical, mining and power generation. Most advancement in material technology it experiences are in the aerospace, defence and oil/gas industries. The development of so-called ‘super alloys’ for these sectors is constantly pushing material performance boundaries. However, the tougher these materials become, the tougher the tools need to be to work the new generation of alloys. The structure of controls and checks throughout the manufacturing process, backed by documented procedures and support personnel, ensures that they continually manufacture products that will exceed customer expectations. Today’s metal working industry faces the relentless challenges of producing product faster, better and cheaper than before. Such challenges require innovative technology to world standards. Sutton Tools meets this challenge, through its commitment to research and development. 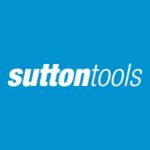 Sutton Tools R&D includes all aspects of manufacturing and development. They simulate actual production conditions to optimise tool design, and benchmark tool performance to exceed market standards. Sutton Tools Engineering Department has state of the art technology in measuring and design equipment, which has been critical in the continual development of machine tools.